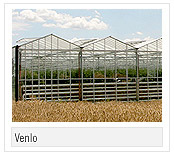 Since many years the Venlo greenhouses are the favourite of growers in the Netherlands and also in abroad. The popularity is shown by the fact that worldwide some 20.000 hectares of this type have been built. For the framework hot-dipped galvanized steel is used, whereas roof, gables and sidewalls are made of extruded aluminium profiles. Precise climate control requires sufficient ventilation capacity and accurate installation. Depending on the roof pane/width one can choose from 1-, 2- , 3- or 4 pane ventilators. Panes can be between 0,8 to 1,2 m long. Mechanisation using a swinging system or a tube/rail system allows exact control. A combination of both systems for maximum ventilation capacity can also be installed. Boeters XLR Cabrio is a completely opened-roof greenhouse which can be closed in 1 minute in order to transform it to a normal greenhouse - this is the newest innovation of greenhouse constructions. 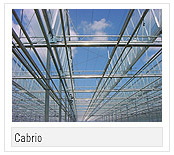 By creating XLR Cabrio greenhouses the main principles were to achieve maximal ventilation, and light. The roof of the glasshouse is composed by two ventilating row, fixed from valley. The two ventilating row are moveable independently from each other owing to a special motive system. Both sides can overlap each other by this solution it possible to decrease the affection of the wind, rain and snow on the climate inside the greenhouse. Cabrio greenhouses are primarily suitable for growing plants, ornamentals, garden-trees, that is the reason why they are popular in floriculture This type of greenhouse is available in the known size of Venlo and wide-span greenhouses but can be also ordered in special size if requested. 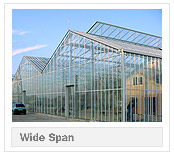 Since decades wide-span greenhouses are well-known. Wide span greenhouses are continuously developing to fulfil the demand of optimal climate. They attend much to the perpetual ventilation system on the roof, which is opened from both sides. Units of wide-span glasshouses are fabricated from hot dip galvanized steel and aluminium which meet even to the strictest regulations.